The mad rush of the holiday season, busy lives, -- so easy to miss connecting with friends. Here's an easy solution: drop in to Hemingway's in Yorkville after work on Friday the 19th. Head upstairs to the back room, order some suds and see some buds. Good pub food. Modest prices ($$). Rated 4 out of 5 stars. Bring your best tall tales. It's Hemingway's, after all, and he lived here, working for the Toronto Star in the early 1920s on his way to becoming a legend. Even the tale he told that landed him in Toronto is fishy: his experiences as a soldier with the Italian army during the First World War. But Hemingway never fought with the Italian forces. He was a volunteer ambulance driver with the Red Cross when his leg was seriously wounded by mortar fire and eventually sent home, having served for two months. That's hardly a great story, so Hemingway got himself a custom-tailored Italian officer’s uniform and cape, and made up a better one! 142 Cumberland St, between Bellair and Avenue Road. 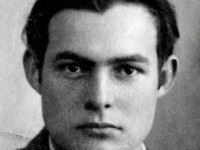 The Bay subway station is closest. . Hemingway passport photo, 1923.